I listen to my heart and with my heart. My heart pays attention to others, listening to their inner voice, their unspoken words. I had a bit of a “duh” moment when beginning today’s drawing. I was listening to the Guiding Thought before putting crayon to paper when I realized something: so far on this Journey, I’ve focused this Guiding Thought on other people’s hearts…but not on my own. Despite the first line saying, “I listen to my heart,” I have only been focused on listening with my heart on this day of each round. My heart was telling me it wanted to be heard. On the one hand, I thought this was a bit ironic, since this whole Journey is about kindling a relationship with, and expressing, my heart. Yet…there it was…my heart, telling me it was feeling overlooked. On the other hand, when I tuned in to this, I really did feel that I was missing something important. Now, after the past bit of time struggling on this Journey (see yesterday’s post! ), today’s feeling and drawing are very helpful and comforting. 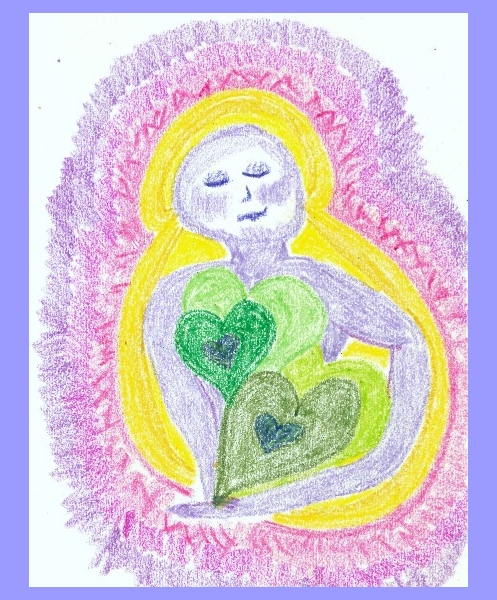 This drawing is all about the gentle, compassionate enfolding of my own heart; soothing myself, being gentle with myself, having patience with myself, accepting myself.